The reinforcement of the transatlantic relationship, secret operations on all sides, skirmishes between the Chinese and North Americans in the China Sea, trade wars, hard rights rising, warning shots on financial markets… It looks like the world is about to switch to “something completely different” (as the Monty Pythons would say). 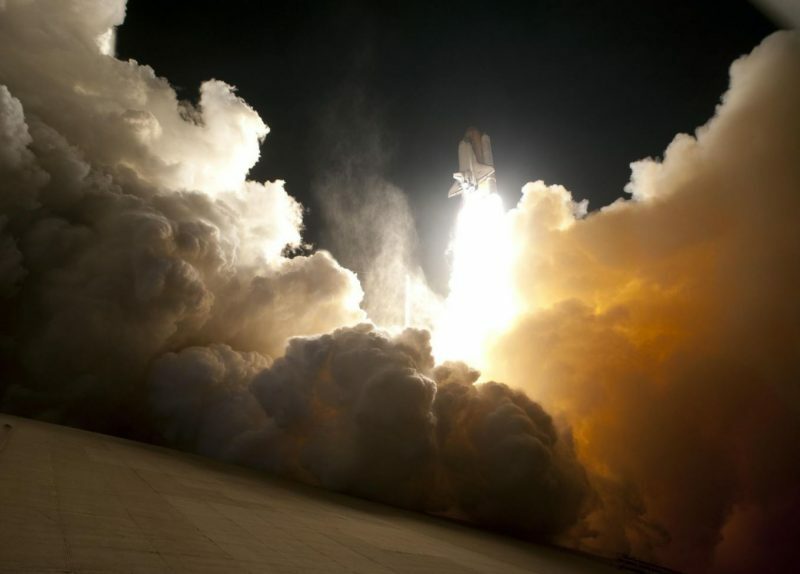 An explosion of markets? Cold War? Hot war? Or labour pains? 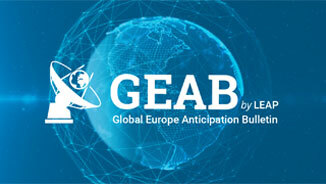 We invite you to read carefully the ‘calendar of future events’ we are presenting in this bulletin. 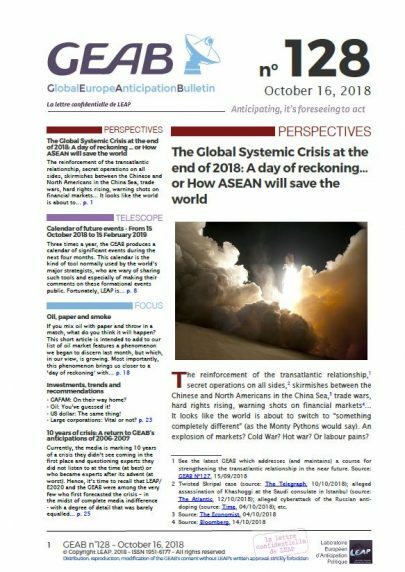 It clearly reveals that the October-November 2018 period represents a gigantic tipping point for the global systemic crisis that we have been analysing since 2006. Huge restructuring energies are emerging, particularly around ASEAN, in the context of US sanctions against Iran and with mid-term elections in the sights. All this is enough to upset the financial markets which do not know what sauce they will be served with. Our readers know how much attention we pay to the strategy of the Saudi-Israeli-American camp concerning Iran. The battle going on since Donald Trump announced the withdrawal of the US from the Iranian nuclear deal really deserves the prize for the most breathtaking scenario at the next Oscars. The question arising in this final period before the implementation of the sanctions is as follows: Can the world support the freezing of its oil reserves if the mullahs’ regime does not make a move? But as the deadline approaches, with Iran having resisted pressure, the world is getting frantic about circumventing these sanctions. Clearly, it is unable to support the withdrawal of the 157 billion barrels of Iranian reserves from the market. Hence, Iran is winning this standoff and it is the US, Israel and Saudi Arabia which are likely to find themselves isolated. So, what is on the next page of this script? The case of journalist Khashoggi, in which Turkey is accusing Saudi Arabia of assassination in its consulate in Istanbul, is a new twist, providing a tangible expression of the unsustainability of imposing the 4 November deadline, thus forcing a reversal of the situation with respect to Iran. Indeed, this case is causing a complete turnaround of the international community vis-à-vis Saudi Arabia and is clearly playing in favour of Iran. So close to the deadline of 4th November, the exploitation of this case by the actors concerned is not by chance. 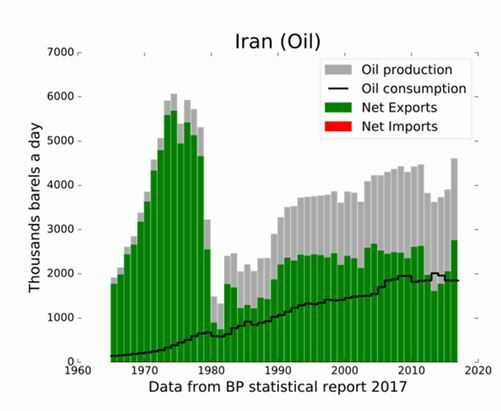 One might even wonder if the oil sector, anticipating relative failure of the sanctions against Iran, does not see there the occasion to create a new front of reserves’ freeze to maintain oil prices high… though that sounds like madness and inevitably a counter-productive strategy. In any event, even in the USA, even in the Republican camp, senators like Marco Rubio are calling for a strong response against Saudi Arabia to safeguard the country’s ‘moral credibility’. Trump is withstanding for the moment, believing that cutting arms supplies (or oil supplies) is like punishing himself. Be that as it may, the debate over the undeclared Iran-AS conflict has clearly shifted the balance and the future of Israel and the Middle East along with it. The terms of the new standoff could soon become as follows: ‘Saudi Arabia/UAE will first withdraw from Yemen and Iran will follow by withdrawing from Syria/Lebanon.’ These terms are at least as legitimate at this stage as the previous ones, namely: ‘Saudi Arabia stopped funding ISIS and other terrorist groups (in August 2017) and Iran must now stop funding the Hezbollah.’ But this new negotiating axis bypasses the trio US-AS-Israel who have lost the hand to the benefit of a vaguer group composed of Europe, Turkey, Iran, China and Russia. How will the United States respond to this new situation? 6 November: A new American policy? The mid-term elections are likely to reduce Donald Trump’s power by decreasing his majority in the House of Representatives. On the one hand, since 1934, these elections have systematically been sanctioning the party in power. However, on the other, the failure of the Iranian strategy and especially the heating of the markets, are rather bad omen for him. That said, depending on the outcome of the election and the degree of sanction that American opinion will offer him or not, Trump will more or less hold on to the cards to be able to follow up with the strategies he has posed during his first two years of presidency. Apparently, we are not the only ones to worry about this. It is reflected in the Asia/ASEAN agenda in the weeks preceding, not by chance, these pivotal dates of 4 and 6 November.